I have longed to share this meal with you . I am the living bread which has come from heaven; whoever eats of this bread will live forever. 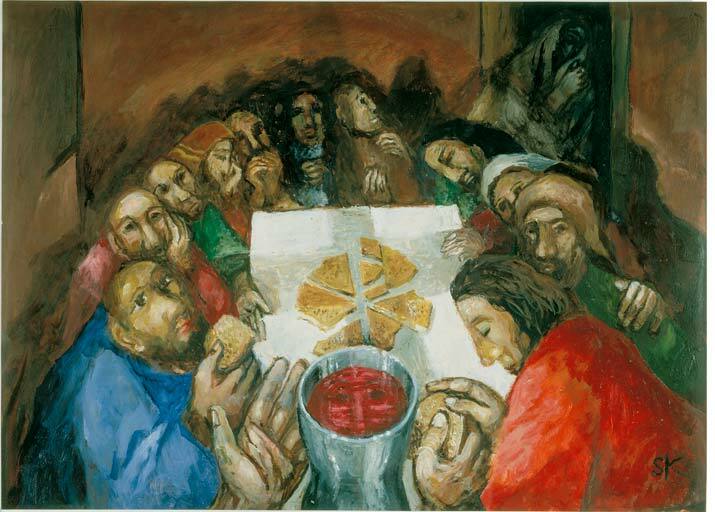 The bread I shall give is my flesh and I will give it for the life of the world . Truly, I say to you, if you do not eat the flesh of the Son of Man and drink his blood, you have no life in you. The one who eats my flesh and drinks my blood live with eternal life and I will raise him up on the last day. My flesh is really food and my blood is truly drink. Those who eat my flesh and drink my blood, live in me and I in them. Just as the Father, who is life, sent me and I have life from the Father, so whoever eats me will have life from me. This is the bread which came from heaven; unlike that of your ancestors, who ate and later died. Those who eat this bread will live forever. What words or image sin the picture stand out?